On the eastern coast of North America lies an intricate assembly of beaches, islands and crooked strips of land narrowed by the unrepentant embrace of the Atlantic Ocean. It is called Cape Cod. The outstretching peninsula of this coastline was described by Norman Mailer as a disagreeable arm of an elderly man, whose hand curled round extending a bony middle finger to the south. On the curving, fleshy palm sits a town called Provincetown (or P-Town as the locals call it). Despite its small size it boasts the second largest harbour in the world. Its streets are full of art galleries and many writers (like Mailer) have lived and worked here. In the centre of the town stands a large wooden building with white painted horizontal slats and a two tier bell tower. Originally built in 1860 as a Methodist church, it now houses thousands of books and functions as the town’s library. As such it is a hub of the community and the service it provides is well-loved and fiercely defended by the people who live here. I was told that the library had a ship inside that was worth a look. For some reason (I like to put it down to my own creative imaginings) I expected the ship to be in a bottle. I was wrong. As you walk up the stairs to the second floor the bow of the ship looms before you. Her name, the Rose Dorothea, is ornately painted in gold against the black wooden hull. She is a magnificent sailing ship. And quite clearly, far too big to be imprisoned in any bottle. The library and its books are dwarfed by her majesty. Two holes have been crafted into the ceiling to accommodate her masts and the oval-shaped reading room at the east end of the library is penetrated by her bow sprit. The main boom hangs ominously over the readers at the other end who turn their pages and tap their laptops, unthreatened by the enormity of her structure and un-struck by her prominence. But when I look at her, this ship amongst the books, I can’t help but feel that in the thread of her sails and the grain of her deck, she has more adventurous tales and more workings of history than any of these pages would care to impress upon the patrons of P-Town. Sue Stout is forty, a mum of two from Liverpool England, studying for a Master’s Degree in Creative Writing at Edge Hill University in Ormskirk, England. She has been a primary school teacher for eleven years and is currently hooked on training for triathlons, which she’s completely rubbish at but getting better. Sue is also the winner of the British GQ Norman Mailer Writing Competition. 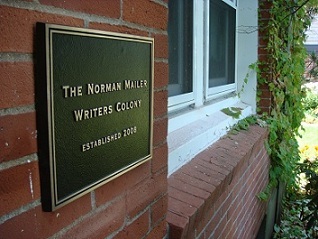 Judged by British GQ senior editors and contributors and other distinguished literary and publishing figures, the competition is held annually and carries a Mailer Nonfiction Fellowship as part of the prize. To find out why Sue is training for triathlons, look out for the forthcoming piece in GQ (sneak preview here).